Figure 1. Western Sugar Cooperative. (Photos by Gary Stone). Please click on dots below to view photo slide show. Figure 2. 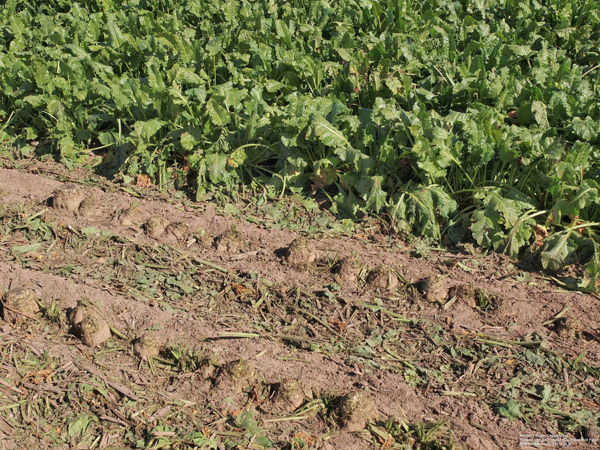 Defoliated and un-defoliated sugar beets in the field. Figure 3. Sugar beet puller and truck transportation. Figure 4. End dump truck at piler. Figure 5. Side dump truck at piler. Figure 6. Harvested sugar beets in pile. Figure 7. Sugar beet pulp for livestock feed. Figure 8. Final product. From seed, to beet, to sugar. The single sugar beet seed is on the lid. 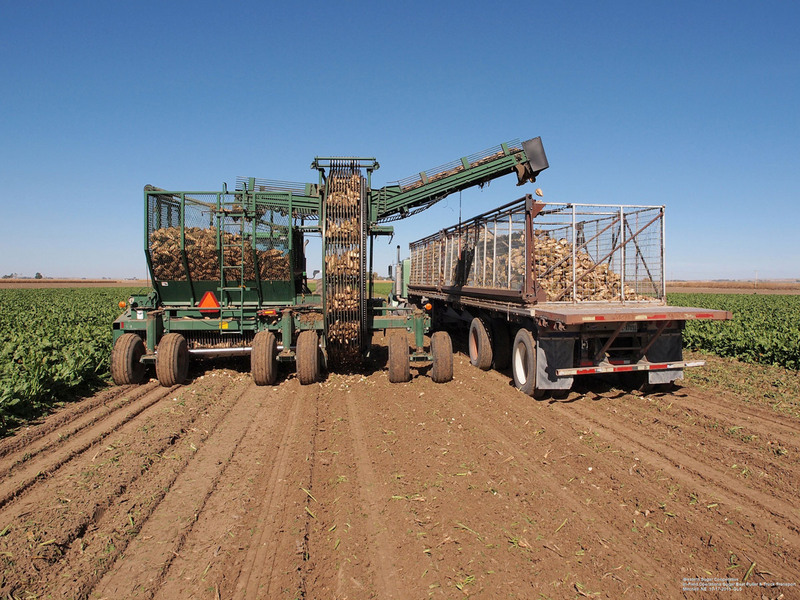 Sugar beet harvest is underway in the Panhandle of western Nebraska, eastern and northcentral Wyoming, southern Montana and northern Colorado. So far this has been a good year for growing and harvesting sugar beets. In mid to late April, producers plant the sugar beet seed, about one pound per acre. The sugar beet seed is coated which allows for better final stand counts of 30,000 to 40,000 plants per acre when planting. Planting row width will be either 22- or 30-inch for this irrigated crop. If all goes well through the growing season of approximately 180 days of wind, hail, late/early freeze, and whatever Mother Nature throws at the crop, full harvest will begin around the first week of October. 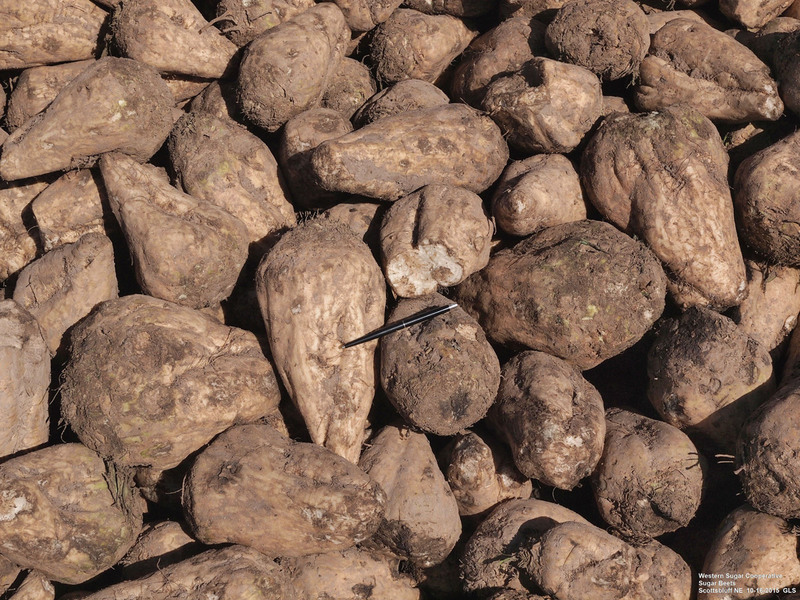 Some producers with a large number of acres of sugar beets usually have the resources to harvest the crop by themselves. Other producers have their sugar beet crop custom harvested, while the remaining producers work with their neighbors to harvest the crop. One producer may have the defoliator, the other the puller, and all usually have semi-trucks to haul the sugar beets to the factory. Weather — temperature and how wet the fields are — will dictate when and how much of the crop can be harvested at any one time. If the weather is too warm, the sugar beets will not store well in the piles and rot, so the harvest is postponed until the weather is cooler. If the fields are too wet, the pullers and trucks cannot get through the fields and the sugar beet roots will be too dirty. The first operation of sugar beet harvest in the field is to remove or "top" the sugar beet foliage (Figure 2). A tractor pulls the defoliator through the field. This removes the sugar beet leaves from the root crown, leaving the sugar beet root to be "pulled" from the soil. The next step is to "pull" or lift the sugar beet roots from the ground by a sugar beet puller, which will then auger them into a truck box to be taken to the sugar beet factory for processing. The puller is also pulled by a tractor through the field. Depending on the row spacing of the crop, a defoliator may take from four to nine rows of beets. A puller may harvest from three to nine rows of beets. Some producers in the area have machines that will defoliate and pull the sugar beets in one pass through the field (Figure 3). 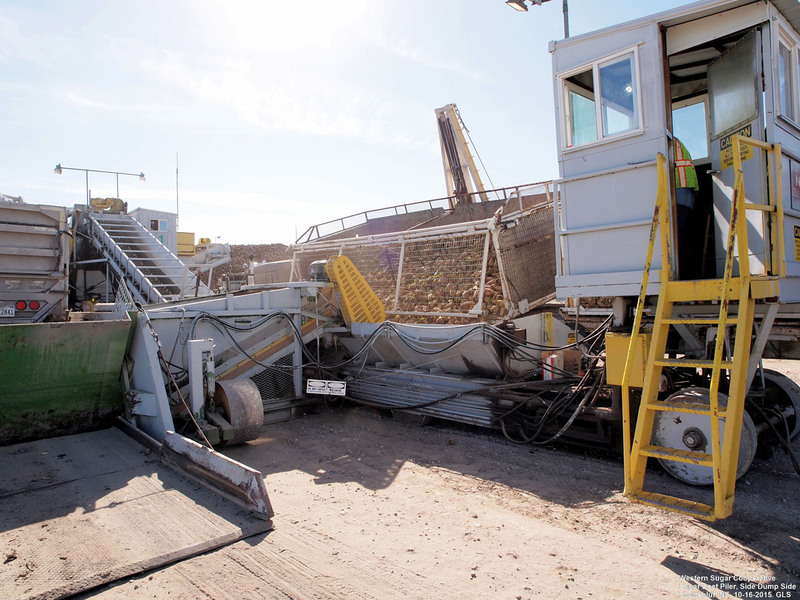 Once the truck box is full of sugar beet roots, the driver takes them to the sugar factory to be piled for processing at a later date. At the Scottsbluff sugar factory, there are four pilers in operation. Three of the pilers can take either end-dump trucks or side-dump trucks (Figures 4 and 5). The remaining piler is end-dump only. Each producer has a bar-code number on the side of his truck to keep track of his sugar beets. Each truck is weighed in and weighed out for each load. Sugar beet samples are taken from each load to test for sugar content. Turn-around time can be fairly quick if all the pilers are in operation and there are no breakdowns; otherwise, it can be a long wait in line to unload. 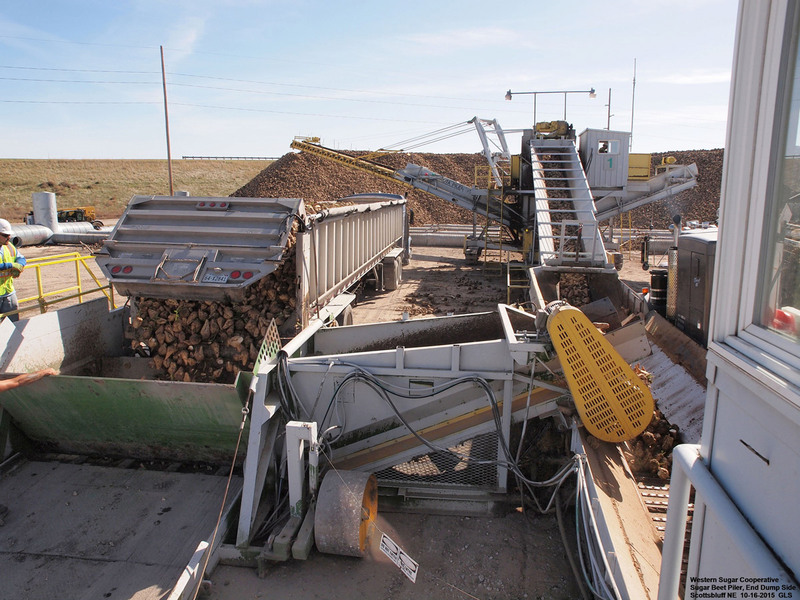 The sugar beets are piled (Figure 6) and processed as quickly as possible. The "campaign" or seasonal processing of the sugar beets may last into February of the following year. Yields will run from upper 20 to upper 30 tons per acre with 14% to 18% sugar. Payment to the producer is based on the tonnage, sugar content, sugar loss to molasses, and tare. 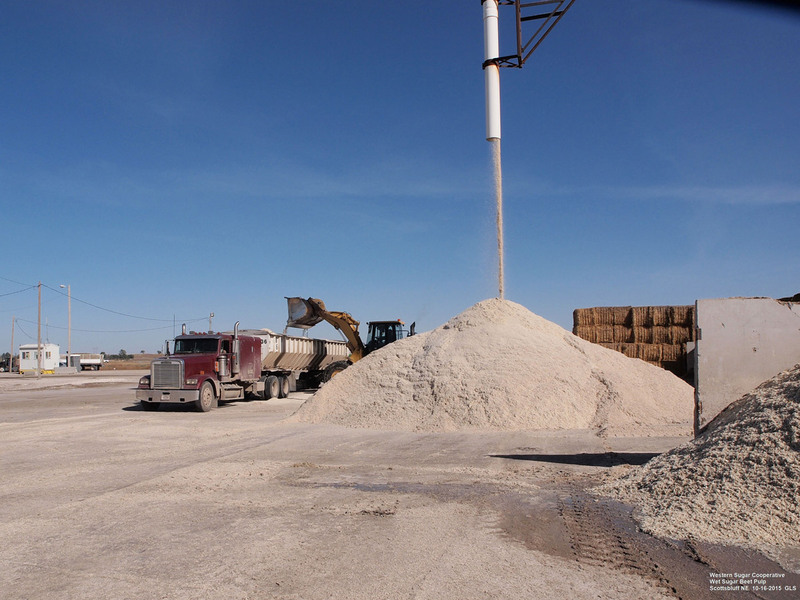 Since Western Sugar Cooperative is grower owned, they all share in the pile loss. The processing of sugar beets into sugar has been around a long time. The first sugar beet processing took place in Silesia (Germany-Poland-Czech Republic) in 1802. The Western Sugar Cooperative (Great Western Sugar Company) had its origins in the early 20th century by Charles Boettcher and others, in northern Colorado. The sugar beet roots are taken from the pile and washed to remove any dirt and debris. The clean roots are then sliced into "noodles" or cossettes. The sugar is removed from the cossettes by hot water baths. The remaining sugar beet root or "pulp" (Figure 7) is fed to livestock. The sugar and water mix or "raw juice" is run through a series of purifiers and filters. This removes any impurities and non-sugars. The raw juice is run through evaporators to concentrate it into "thick juice." The thick juice, liquid sugar and molasses, is then crystalized and sent to the centrifuges. At the centrifuges, the sugar crystals are separated from the molasses. The crystalized sugar is sent to the granulators for more drying and processing. The granulated sugar is then packaged into bags from 1 lb to 1,000 lb or sold in bulk. The molasses is reprocessed to recover more sugar. Powdered or confectioners' sugar is finely ground granulated sugar (Figure 8). Western Sugar Cooperative is a grower-owned business with over 850 shareholders. 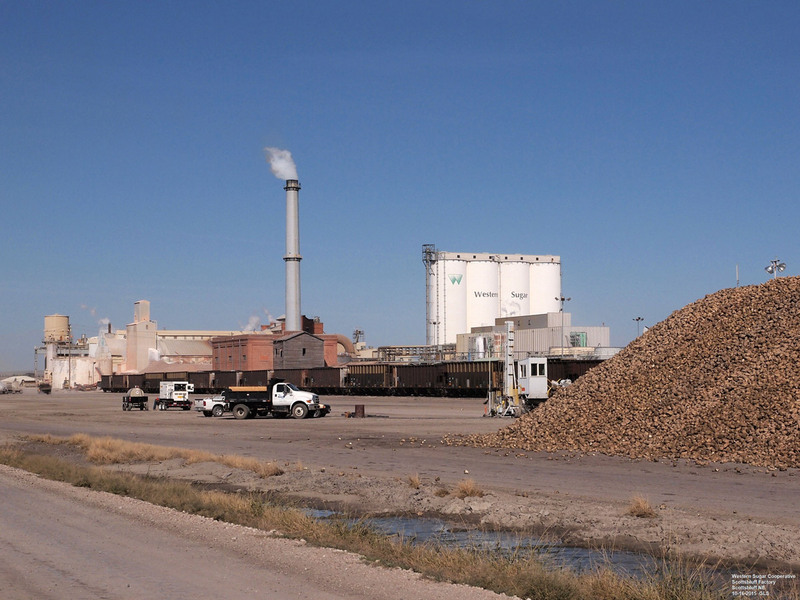 They raise sugar beets on 135,000 acres in Nebraska, Wyoming, Colorado, and Montana. 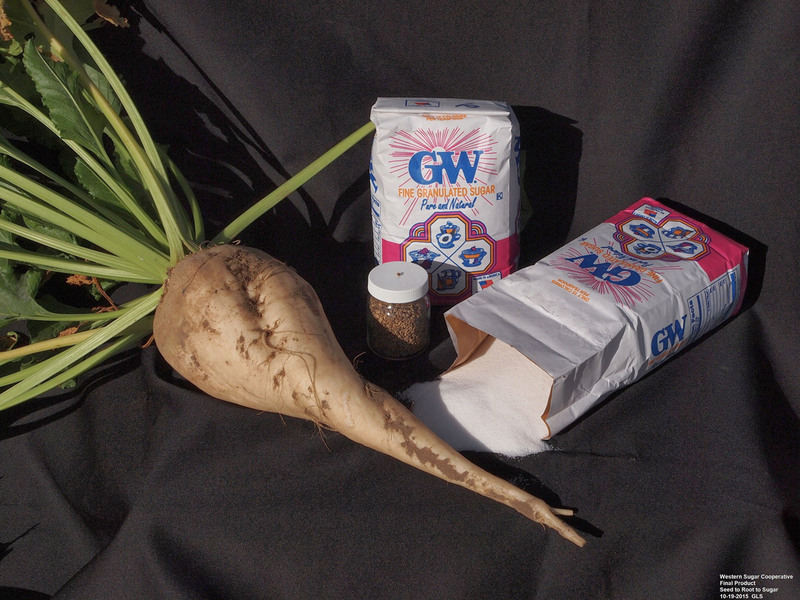 More information on Western Sugar Cooperative and the sugar beet process, products, nutritional facts, recipes and history can be found at: http://www.westernsugar.com. The UNL Extension publication Sugarbeet Production Guide (EC156) and other resources are available in the CropWatch Sugar Beets section. My thanks to Western Sugar Cooperative and producers for letting me take the photos.